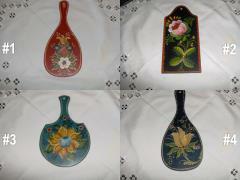 Turn of the Century is offering for purchase, painted-Rosemaled pieces done by Jan Boettcher. 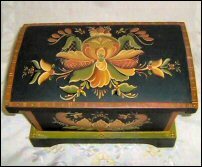 I have been rosemaling since the early 1980's, and have studied extensively with well known teachers here in the U.S., as well as with Norwegian teachers in the U.S. and Norway. I paint and teach in oils. 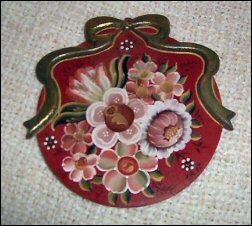 I paint most of the rosemaling styles, including Rogaland, Old Rogaland, Valdres, Gudbrandsdalen, Telemark, Hallingdal, Vest Agder, and OS. All projects on this page are "one of a kind". If you wish to purchase an item, please select that particular piece just once. 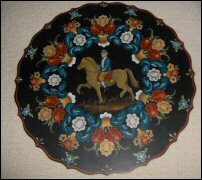 Along with your signed piece, you will receive a brief history of the rosemaling style of that piece. The history makes each item a little more special. I also accept consignment work and offer classes upon request. Please contact me directly with questions or requests. Want to learn more about me? You can read my Bio on the Indiana Artisans website. This is my painting of the the Scroll and Lace Bowl on special in our online store. 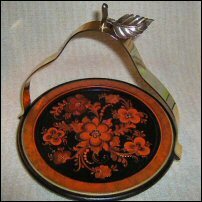 It is featured in the #1 issue, 2012 of The Decorative Painter Magazine. Click the image to visit this product listing in our store. I invite you to look through the rosemaled pieces below. You can see larger views of them in our online store where they are available for purchase. These are one-of-a-kind paintings with only one available for sale. 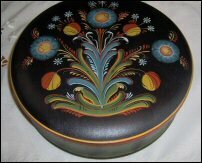 This bowl measures 10 inches, has a removable lid, and is painted in the Vest Agder style of Rosemaling. It is finished inside and out, and ready to ship. 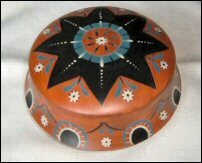 This 6 inch covered bowl is painted in a special geometric style found near the Viksdalen area of Norway. It was a fun piece to paint and would make a sweet gift for a boy or girl. Finished inside and out. This is a special little basket that will hold cards, candy, or whatever you wish to store. It is a great little basket for a gift. Just tuck in something a little extra special to make your special person smile or give just as it is! The style on this basket is called Viksdalen and is one of the lesser known styles of Rosemaling, but it is getting lots of attention and is gaining in respect among the Rosmaling community. The basket is painted inside and out! 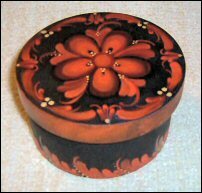 This is a sweet little trinket box, 4 inches round, painted in the Raumsaumsmalen style of Rosemaling. The cover lifts off. Painted and finished inside and out! This sweet little trunk is painted in the Hallingdal Style. It measures 9.5" x 6" x 5" High. It is finished inside and out and ready to ship. This piece measures 30 inches. It's back grounded in blue and antiqued to look old. It is painted in the Telemark Style of Rosmaling. When hung on the wall for decoration, the horse is facing downward. This is a very traditional Norwegian piece. Packet includes the mini wood cutting board, a color photo, pattern, supply list, and complete instructions. These packets are great beginner projects or just a great small piece to paint for a gift to a special person. $13.50 per packet (including wood piece). Four to chose from. All projects are designed and painted by Jan, unless otherwise specified. All copyrights © apply. We reserve the rights to these designs. Pictures may not be copied in any manner.